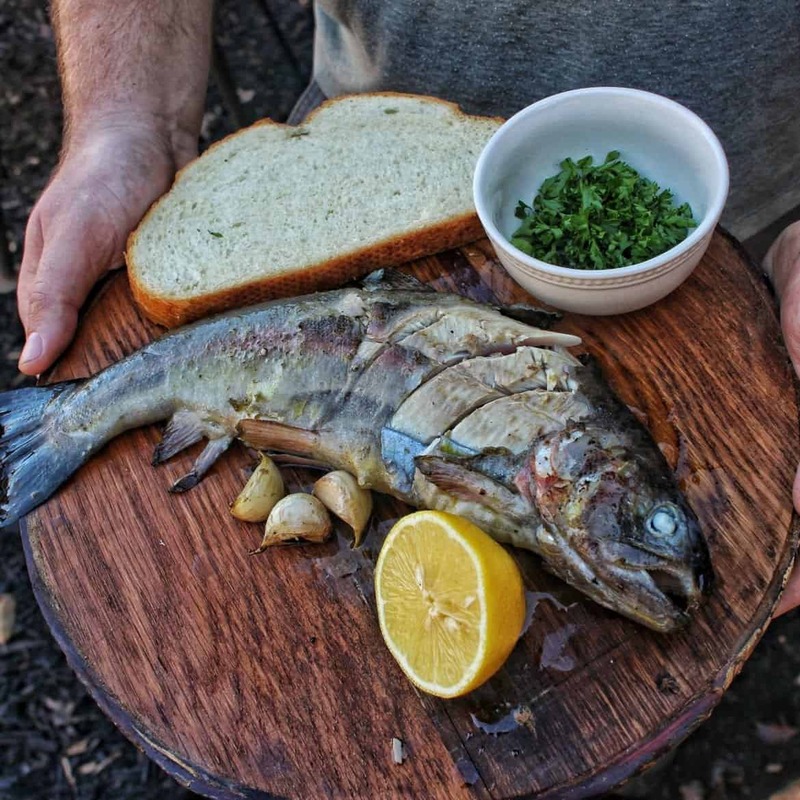 Cooking trout over fire is one of my favorite things to do with RVing! It is simple, delicious and easy to do. The only difficult part about cooking fish is deciding between grill or cast iron. This time, I decided to go with a skillet on my Cast Iron Trout recipe! Every had Cast Iron Trout? 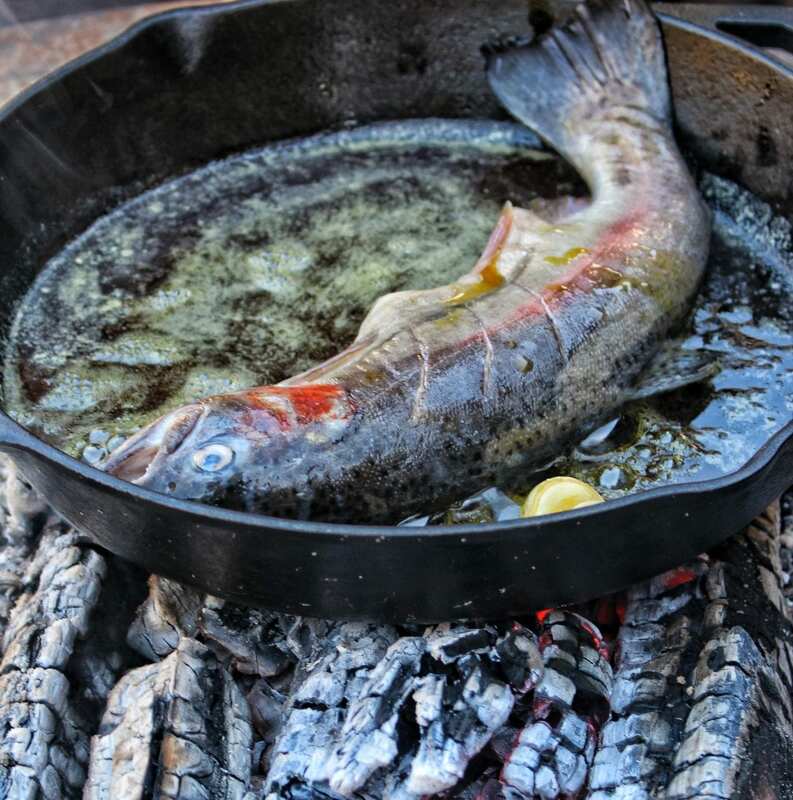 Cast iron is such a great way to cook fish over fire because it allow you to oil the pan. Losing some skin in the cooking process is just the way it is. Cast iron helps to minimize this issue. That is why I love this Cast Iron Trout recipe. In my Cast Iron Trout recipe, you will season with lemon juice and sea salt. Throw the fish into the cast iron with garlic cloves, olive oil and butter. The butter and olive oil will help to crisp up the skin while not completely destroying it. Cook for about 3 minutes per side and then pull off. Top it all off with more lemon juice, sea salt and chopped parsley. That is it. I like to serve my Cast Iron Trout with a warm piece of sourdough bread and some white wine. Dip the bread into the skillet to soak up all the flavor that was cooking in it. The recipe is perfect for those whose life is on the road or always traveling. Try my Cast Iron Trout recipe and you will learn how to cook over fire in a simple but delicious way. Related Recipe: Want dessert to? Try my No Bake Bourbon Apple Crisp! Learn how to make simple and delicious food with this buttery and crispy Cast Iron Trout recipe. Add olive oil, butter and garlic cloves to the skillet and cook for 1 minutes. Slice 3 lines into the side of the fish to allow the seasoning to penetrate. Lather trout with olive oil & lemon juice and then place in skillet over medium to high heat. Cook for about 2-3 minutes per side. Pull trout off, season with more lemon juice, parsley and salt. Serve (with sourdough bread) and enjoy! Equipment Needed: Fire pit/grill, cast iron skillet, wood, knife, cutting board and fire starters.